People living or working near areas of hydraulic fracturing may be exposed to certain aerial pollutants, including some that are associated with a higher risk of cancer and respiratory ailments new research has found. The study was carried out by scientists from Oregon State University (OSU) and the University of Cincinnati, who found that hydraulic fracturing or fracking, a technique used to extract natural gas from rock formations, emits harmful pollutants known as PAHs (polycyclic aromatic hydrocarbons). 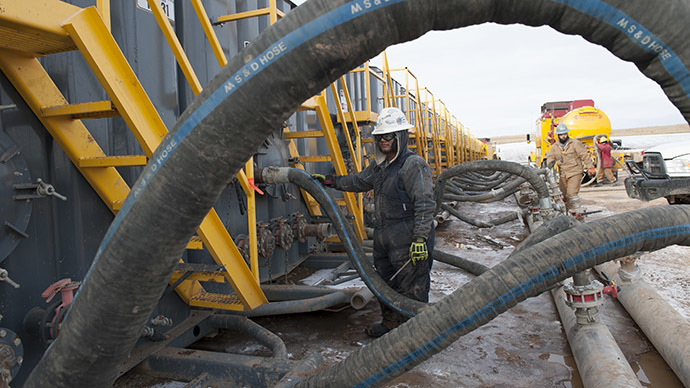 “Air pollution from fracking operations may pose an under-recognized health hazard to people living near them," said the study's coauthor Kim Anderson. Anderson’s team collected samples from Carroll County in Ohio over a three week period last February. Carroll County has an active natural gas well almost every square mile as it sits on top of the Utica formation, an oil and gas rich seem of subterranean shale. The study was led by Erin Haynes from the University of Cincinnati, a public health expert who decided to begin the research after she was approached by Carroll County residents who wanted to know more about the health risks from fracking. The results of the study appeared in the online edition of Environmental Science and Technology. The team of researchers placed air samplers on properties owned by 23 volunteers living or working at sites ranging from right next to a gas well to more than three miles away. The samplers were made from T-shaped aluminum boxes which contained specially treated polythene ribbons that could absorb contaminants in a similar way to human cells. The highest levels of PAHs in the area studied were right next the gas wells, and this decreased by about 30 percent with distance. Even at sites more than a mile away from a well, levels were higher than in an area of Chicago right next to an oil refinery, where previous research had been conducted, and ten times higher than an area of rural Michigan where there are no gas or oil wells. However, Anderson and her team cautioned that her figures were worst case estimates and that in any case it is impossible to predict the risk to particular individuals. “Actual risk would depend heavily on exposure time, exposure frequency and proximity to a natural gas well,” she said.